A fifth region of language formation was south-eastern Asia, where there still prevails a group of languages consisting of monosyllables without any inflections, in which the tone used in uttering a word determines its meaning. This may be called the Chinese or MONOSYLLABIC group, and it includes Chinese, Burmese, Siamese, and Tibetan. The difference between any of these Chinese tongues and the more western languages is profound. In the Pekinese form of Chinese there are only about 420 primary monosyllables, and consequently each of these has to do duty for a great number of things, and the different meanings are indicated either by the context or by saying the word in a distinctive tone. 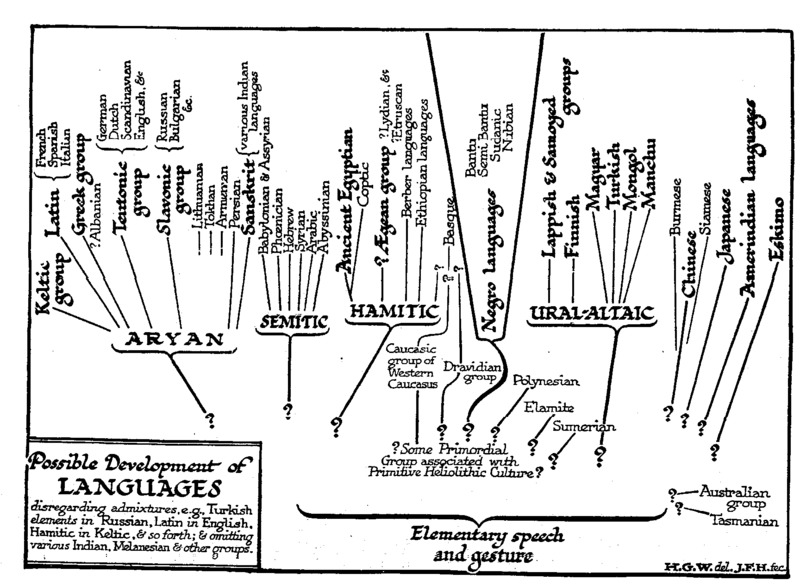 The relations of these words to each other are expressed by quite different methods from the Aryan methods; Chinese grammar is a thing different in nature from English grammar; it is a separate and different invention. Many writers declare there is no Chinese grammar at all, and that is true if we mean by grammar anything in the European sense of inflections and concords. Consequently any such thing as a literal translation from Chinese into English is an impossibility. The very method of the thought is different. Their philosophy remains still largely a sealed book to the European on this account and vice versa, because of the different nature of the expressions. Disregarding admixtures, e.g. Turkish elements in Russian, Latin in English, Hamitic in Keltic, and so forth; and omitting various Indian, Melanesian, and other groups.